If you have no plan yet during the Public Holiday on Malaysia Day, why not make a trip to Tawau. The 14th edition of the sand castle building competition will be held at the Batu Payung beach in Tawau this September 16. I gathered this from a press release in the DE. The programme, in conjunction with Malaysia Day, is organised by the Hokkien Association of Tawau (Pemuda) in collaboration with the Tawau Municipal Council. According to Pemuda President, Kong Wei San, the competition will begin at 8.30am and is scheduled to be launched by Assistant Finance Minister Datuk Tawfiq Abu Bakar Titingan who has contributed RM1,000 to support the programme. Tawau sounds like an interesting place to explore. i hope to visit it someday. the sand castle looks amazing. 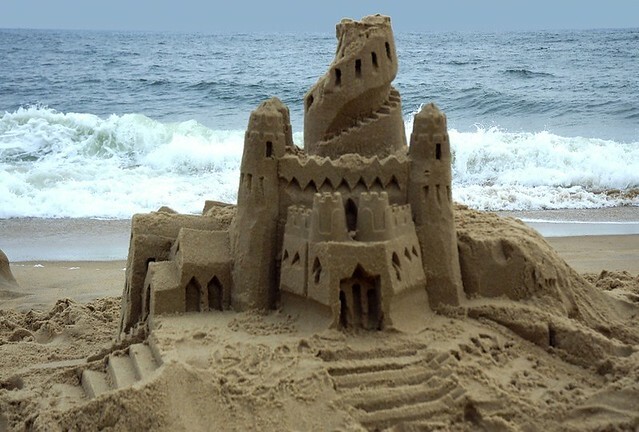 Creators of these sand castles are very talented and patient. It is definitely fun to watch the structures emerge from nothing to masterpieces.